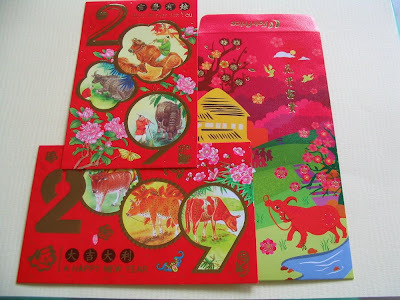 O that the year of the Ox will usher in a mad Bull run ! It seems appropriate for me to post here my bull seals. 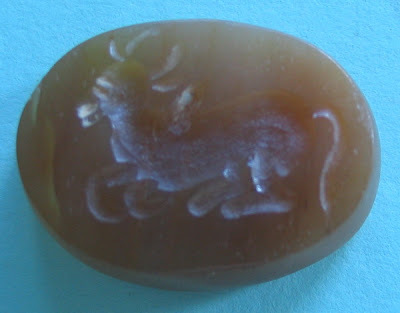 Lest I be accused of being off-topic as I have self declared this blog to be about jade and beads, I must quickly add that in bead terminology a seal is also bead related especially bead seals. 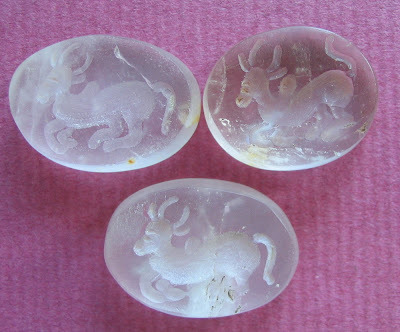 The seals I show below are made of crystal and were purchased in Cambodia. 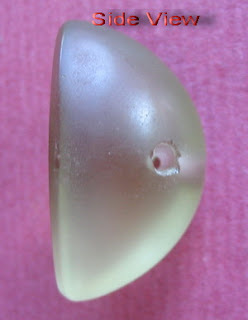 The first bull seal above is dome shaped with two holes drilled at the top for stringing and was probably used as a pendant or amulet. 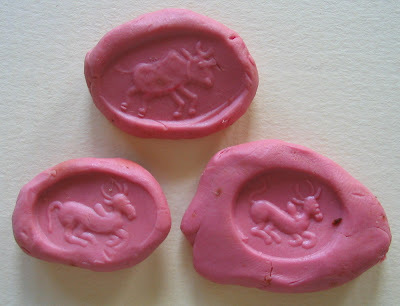 The next 3 seals also depict bulls but are flat and without holes. 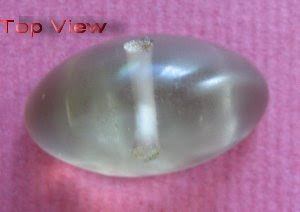 I have come across seals like these in the ACM (Asian Civilisation Museum) According to the writeup given on the ACM display, Khmer crystals have been discovered at sites along the Mekong Delta. It goes on to say that the engraved crystals "probably served as seals or stamping dies and clay impressions taken from the seals may have been used as offerings as they have been found under boundary stones and the foundations of temples." The engraving on my seals are beautiful and I sure hope they are authentic Khmer period seals related to those described in the ACM exhibit. 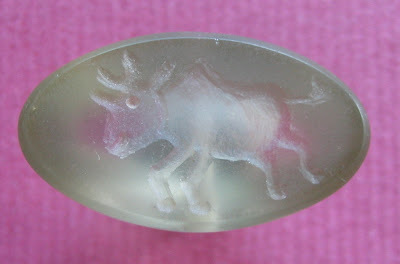 On page 124 of Ornaments from the Past: Bead Studies after Beck there is also a picture of an intaglio of a bull attributed to Indian origin which is somewhat similar to my above seals. While the first bull looks like it could "charge" the remaining three bulls are more like "sitting bulls", very mild and docile. 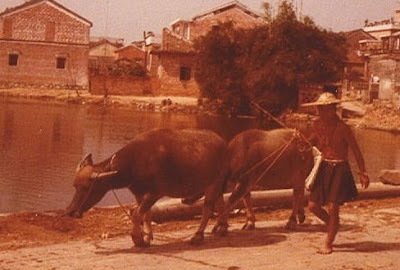 I have seen sculptures of such peaceful bulls in temple grounds of the Angkor ruins. 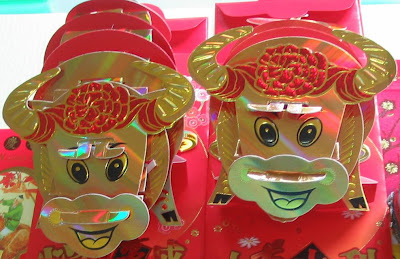 The color for Lunar New Year is red and it would be unseemly for me to post only white crystal seals . Actually white is taboo for tne New Year, so I'd better not defy tradition. Lucky I got a brown colored one in my set of bull seals. I think maybe this stone is jasper. 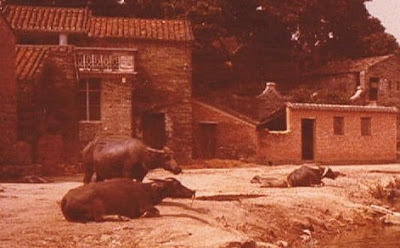 And to conclude my Ox and Bull Story here are some real Water Buffaloes from my old home town, many moons ago!! 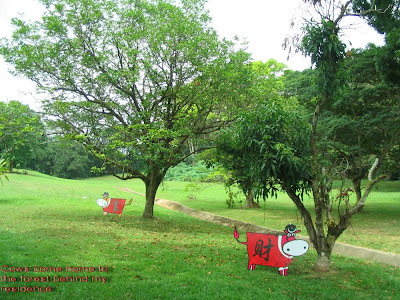 And as a bonus for me someone kindly planted some cardboard cows on the rolling green behind my home to welcome Year of the Ox 2009, how very considerate ! Mooooooo! And oh dear, many of these cows were subsequently stolen ! Tsk! Tsk!